Hammond Ashley died on May 1, 1993 at the age of 91. We have lost an advocate for fine music and fine musical instrument making, and a good friend. Music was always an important part of Ham's life. He played banjo in a dance band while studying mechanical engineering at Stanford University. Later, when working for the U.S. Army Corps of Engineers in Europe, he bought a bass and began learning to play. 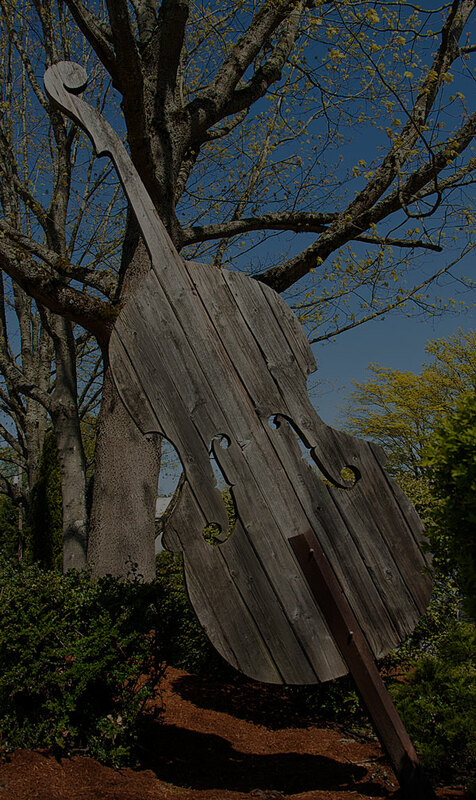 Years later, while working in Seattle as an engineer for Boeing, he played bass with the Highline Symphony, a group he helped to found. 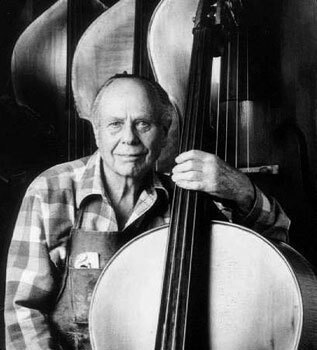 At the age of 80, Ham's hearing deteriorated so he couldn't hear directions from the conductor, so he took up the cello, which can be played without a conductor in smaller groups. He had a woodworking background, too. Ham had his own cabinet shop in 1928 and specialized in custom antique furniture reproductions and fine interior woodwork. His clients included Edward G. Robinson, Jack Benny, Jerome Kern, and Mrs. Oscar Hammerstein. After the Christmas 1963 layoffs at Boeing, Ham Planned on having an active retirement. With a background in engineering, woodworking, and music, lutherie seemed a natural choice. He set up shop under the airport's landing approach and worked on a little of everything, - organs, pianos, and even furniture. But the second floor was devoted to lutherie. He ended up having a whole new 30 year career. His lively interest in advancing the science of sounds led him to explore both the old and the new. Making, restoring, and repairing included experiences with many varieties of stringed instruments including gamba, bass, cello, viola, violin, the eight members of the "new family" of violins, rebec, sitar, sarod, crwth, and harp. But his specialty was the violin family, particularly basses. He worked with Carleen Hutchins of the Acoustical Catgut Society and was an active member of the GAL. Dozens of people worked for and with him over almost 30 years. Ham set the pace. You might see him elbow-deep in papers at his desk, or working with the plates and winding up with glitter all over his face, or all bent over, with curled up hands, carving a scroll, varnishing a bass, or talking with customers, many of whom became friends. At age 90, he cut his hours down by taking more than an hour for lunch, and so putting in less than 44 hours a week. Ham made music by playing, by his craftsmanship, and by making instruments usable and available to others. Joyful noises came from the house over the years as Ham had fun making music with others. Ham knew what he liked, and generously helped himself, as he in other ways helped others. Friends were invited to stay to lunch or overnight on the spur of the moment. He treated others as he'd like to be treated, giving them the freedom to be themselves. When asked if something was all right with him, he'd say something like, "Whatever works for you," or, "Don't undervalue yourself or your work, or others won't appreciate what you do for them." Ham was well educated, interested in a wide variety of subjects, and had a wide variety of friends. He was a woodworker, a builder, a storyteller, a figure-it-out scientific kind of person, a thinker who worked with his hands, a courteous, determined, matter-of-fact, down-to-earth gentleman. He was greatly loved, and he will be missed. Hammond Ashley Associates, Inc. will continue under the guidance of Dave Wilson and Paul Hammond Ashley, his grandson. Ham called the Guild office a few weeks ago to let us know he was dying, and to say goodbye and thanks for everything. I asked him how he was feeling about it, and he said he was tired, that he was ready. He said he missed his wife. They were married for 63 years. She died in 1991. He said there was to be a party at his house. He was so matter-of-fact. I went up there with my wife, Ruth. He was sitting in a wheel chair, looking very content. There were kids running around, and coworkers, family and friends eating and talking, having a good time. Not a tear in the house. Ham and I talked. It was like every other conversation we had ever had. He had such grace and dignity, such honesty. We shook hands, and said goodbye. I learned a lot from Ham, almost none of it about stringed instruments. What a man! I loved the guy. - Jonathan Peterson, Guild of American Lutherie.